We know that this blog subject is one that is completely tried and run through the wringer. We know that every blogger related to trucking has written about this subject. But we’re still going to do it. The reason why is because we know that while some core tenants of maintaining your health as a truck driver don’t change (healthy diet) but other aspects can (i.e. activity trackers). 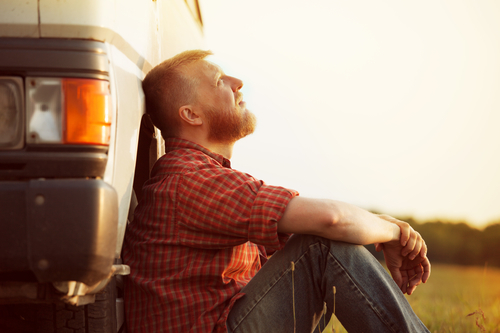 We wanted to put together a step by step list to help you start to maintain a healthier trucking lifestyle. One of the things you will likely hear from personal trainers and others involved in the fitness world is that it is easier to not consume 500 calories than it is to burn 500 calories. This step is probably the most true for truckers as time can become scarce. Try to avoid the drive thru fried foods and stick to greens when necessary. Also, if you find yourself adding on side items that you don’t really need (i.e. fries at every lunch) try to drop that. We also recommend downloading a diet tracking app. Our favorite is Fitness Pal (no business connection to them) because of its extensive food database to make tracking food easy, but because it can help you set daily caloric intake goals. Just tell the app your current information, set a time goal, and it will tell you how many calories you can take in. You can also add simple workouts like running too. It’s always easy to grab that 32 oz Coca Cola when you get the extra value meal but those empty calories add up when you’re on the road. Simply replacing those unhealthy sodas with water can negate a lot of the calories you would normally take in. If you struggle with that due to caffeine needs, try mixing in the occasional unsweetened iced tea. We know as a trucker that the need for caffeine can be huge. Trying to squeeze in a workout, walk, or run randomly will often push it back on your priority list. By dedicating a time(s) each week to allocate towards physical activity can help you hold yourself accountable. If your budget allows for a Fitbit or Apple Watch that have activity trackers built into them, you can try that too. Having somebody to go down this new road to fitness with you can really make the journey easy. You can help hold each other accountable when one begins to slack off. If you find your spouse is often the reason you are being tempted with unhealthy foods, it might be a imperative to have them join you on this healthy journey. These all seem like somewhat basic tips but if you are able to take these four steps, you can make major changes to your health and hopefully increase your quality of life.